On the High Street directly in front of us there are limited free parking bays available. One-hour parking bays are available along the High Street and at present there is unlimited parking by the Church. There is also a public car park within the village (Monachus Lane car park) with 16 red 90-minute free parking bays available, situated next to the public toilets to the left of the car park. Otherwise normal pay and display parking charges will apply – currently 1 hour = £0.70, 2 hours = £1.40. From the car park, go down the walkway to the main High Street. Turn right beside Costa Coffee and we can be found a little further down over the mini-roundabout on the right-hand side. 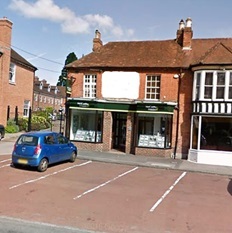 The Body Reset Clinic is situated at the beginning of the High Street on the left-hand side, above McCarthy Holden Estate Agents. Head over the Bracknell Lane (B3011) mini-roundabout and the clinic is directly located on the left-hand side next door to The Viceroy Indian Restaurant. The Body Reset Clinic is situated on the right-hand side just as you are leaving the village. Head past the Monsoon Restaurant and the Golf Club, Costa Coffee, and you will find us just after the mini-roundabout to Fleet Rd (A323) on the right-hand side before the second mini-roundabout to Bracknell Lane (B3011) above McCarthy Holden Estate Agents, next door to The Viceroy Indian Restaurant.